The Chevrolet Silverado is one of the best-selling trucks in America, and there’s a reason for that. It’s powerful, durable, and ready to get the job done. There’s a world of options for the Silverado, and each truck is built with different priorities in mind, from cost to performance to comfort. We'll help you pick the right one for you. We’re focusing on the trims for the regular cab, four-wheel drive, 4.3L V6 engine model. If you're looking to increase the cabin size while sticking with the standard truck bed, you can expect to pay an additional $4,000 for the double cab or $8,000 for the crew cab models on top of the prices listed below. Two-wheel drive models would be a few thousand dollars cheaper, or choose the larger 5.3L or 6.2L V8 engines to bump the price even higher. The WT, or "work truck" trim, has a starting MSRP of $27,585, making it the cheapest of the Chevrolet Silverado 1500s. It's also the most stripped down and commercially-focused of Chevy's trim levels. This truck has front and rear black bumpers, solar absorbing tinted glass, outside manual mirrors in the color black, and 17-inch painted steel wheels. The black accents continue throughout the truck with black door handles. It also comes with a locking, manual tailgate. The interior of the Silverado 1500 WT comes with a 4.2-inch diagonal color screen with USB ports, auxiliary jack, and four total speakers. Safety-wise, the WT doesn’t come with any extra features to protect the drivers and passengers. Seat standard is also vinyl instead of cloth. This is definitely a truck designed to take some abuse compared to the more "lifestyle"-oriented trim levels. The LS has a starting MSRP of $29,610 and definitely comes with more than the WT, starting with three free months of OnStar’s Guidance plan. Additionally, it comes with a front and rear chrome bumper and deep-tinted glass. The outside mirrors are replaced with heated power-adjustable mirrors, still in black. The 17-inch wheels see an upgrade from painted wheels to stainless-steel. The interior of the LS also has better electronic features, like the Chevrolet MyLink audio system. This system provides a seven-inch diagonal color touch screen with USB ports, auxiliary jack, and six total speakers. The LS also comes with Bluetooth connectivity so you can keep your hands on the steering wheel at all times. Power windows and a remote keyless entry are introduced with the LS. Safety remains the same with no upgrades other than the OnStar Guidance Plan for three months. You do have the option to add a rear vision camera for a little extra. The LT has a starting MSRP of $34,010 and has everything the LS has and more. On the exterior, you’ll see body-color mirror caps, 17-inch bright-machined aluminum wheels, body-color door handles, and an EZ-Lift and Lower tailgate. You also the option to pay more for additions like thin profile LED fog lamps and 18-inch bright-machined aluminum wheels or 20-inch polished aluminum wheels. The interior comes with Chevrolet MyLink, but there are improved features here, as well. Instead of a 7-inch display, you get an 8-inch color touch-screen, a six-speaker audio system, Bluetooth connectivity, SiriusXM Satellite Radio, and visor vanity mirrors. You’ll also see an under seat storage below the split-bench seating. Finally, the Silverado 1500 LT comes with steering wheel audio controls. 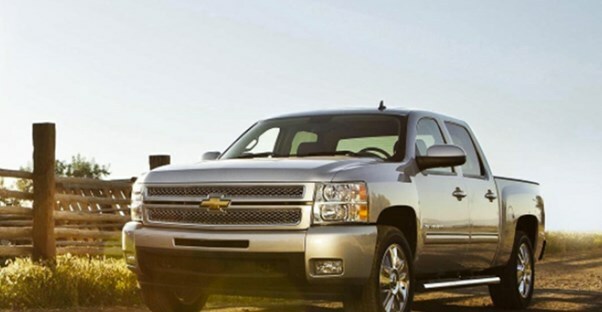 The LTZ trim level reaches the upper end in terms of expense for the four-wheel-drive regular cab Chevy Silverado 1500. It has a starting MSRP of $39,280 and comes with everything you’d expect from the LT and more. This trim level skips the 4.3L V6 engine and, instead, offers the 5.3L V8 as the basic engine option. The trim also comes complete with chrome accents (including door handles, mirror caps, and grille); full LED headlamps, foglamps, and taillights; 18-in. aluminum wheels; and headed leather seats standard.